The Canadian mountain running team had a very successful World Mountain Running Championships. The Canadian men finished in the top 10 for the first time since before the race became an IAAF Championship in 2009. The Canadian women had an excellent finish as well, finished 12th in an unusually competitive year of 17 teams. The Canadian men were led by Kris Swanson (Tumbler Ridge, BC) in 36th position and David Le Porho (Montreal, QC) in 42nd position. Swanson went out hard and held on for a great finish in tough conditions. After the race, Swanson said he was proud of his effort and he was glad that he executed a solid race plan. He "left it all out on the course". Le Porho was battling a cold through the race, but hung on for a strong finish. He was very happy to improve upon his finish from last year under less-than-ideal conditions this year. Jeff Gosselin (Quebec, QC) and Mark Vollmer (Edmonton/Guelph) finished together in 68th and 69th positions, respectively. Gosselin started off charging and hung on for a strong finish. Gosselin felt that the long downhills were suited more for 10k runners with fast turnover and were challenging for someone like him with trail running credentials. Vollmer proved his consistency in his sixth time at the mountain running championships by ensuring the Canadian team of a top ten finish. The Canadian men had no margin of error in their finish, with two team (Ireland and Russia) finishing within one point behind. Sean Chester (Victoria, BC) and Calum Neff (Calgary, AB) rounded out the Canadian team finishing in 92nd and 102nd, respectively. Chester improved significantly from his 2007 placing but is looking forward to improving on this finish in future years. Neff is hungry after his first mountain race to return to the trails. The Canadian women's team had one of their strongest runs in a number of years. Meggan Franks (Athabasca, AB) led the Canadian team in 44th position and Sarah Bergeron Larouche (Quebec, QC) finished close behind in 46th position. Franks and Larouche employed opposite strategies, with Larouche going out hard, and Franks going out more conservatively. Franks says that she was happy with how the team worked together during the race. Larouche enjoyed her debut on the world stage in mountain running. She enjoyed the strong team spirit the Canadian team showed throughout the championship weekend. Melanie Nadeau (Bromont, QC) and Shannon Penway (North Vancouver, BC) finished close together in 56th and 57th positions, respectively. Nadeau used her strength from competitive cycling to power up the hills. Penway described the race as "awesome and painful". The junior men were well-represented by Mathieu Ladouceur who finished in 57th position out of 68 competitors. Ladouceur ran with the savvy of a veteran, running very consistent times for both laps of the two-lap course. He also showed great resilience after only recently overcoming a foot injury prior to the race. He will be a man to watch in future mountain races! The course featured a long downhill section followed by two challenging and steep uphills separated by a short, flatter section. The initial descent, followed by up, made the race even more challenging than the usual up-and-down order, as the athletes found that their legs were fatigued from the descent even before the uphill sections started. It was around 20 degrees Celsius during the race with nothing but clear, blue skies on the beautiful Polish summit. The Canadian team was very happy with the results from the weekend and also with the excellent camaraderie shared with every member of the team. The Canadian Mountain Running Association is excited to announce the team selected for the 29th World Mountain Running Championships in Krynica-Zdr�j, Poland. This year's team features a mix of new team members and returning competitors. After hovering just outside the top 10 of the team competition, the men need only incremental improvements to push the team into the world's elite, but are looking for big results on the course in Poland, which will be featuring both climbing and descending. Different from previous years, the course starts with 300 meter descent before climbing back up to the start. The men will run three laps of the course, going 13.5km and climbing 840 meters. Among the men, multi-time Canadian team veterans Mark Vollmer (Guelph, ON) and Kris Swanson (Tumbler Ridge, BC) and second year team member David Le Porho (Montreal, QC) have been to the World Championships before, and both have an impressive resume behind them. 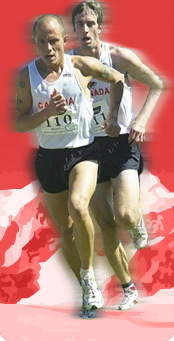 Both men have consistently been the leaders of the Canadian team, Swanson having hit the world's elite with his 30th place result in the relentless of uphill of Slovenia in 2010, and Vollmer achieving a personal best 46th in 2011 in Albania on a course distinctly similar to what can be expected in Poland. Le Porho will be able to utilize his technical running skills from competitive snowshoe racing throughout the winter to improve on his result from 2012. The 2011 and 2012 World Snowshoe Champion and 2013 Canadian Mountain Running champion excelled at the highly technical downhill portion of the course at this year's National Championships in Mt. Sutton, Quebec. Sean Chester (Victoria, BC) is also returning to the team after racing for Canada previously in 2007. Chester has run competitively for the University of Victoria, represented British Columbia at the national cross country running championships, and was ranked 12th in Canada in the 10,000 meter in 2012. Newcomers to the team, Calum Neff (Calgary, AB) and Jeff Gosselin (Quebec, QC), also both have backgrounds in competitive running at the university level. Gosselin, the runner-up at this year's Canadian Mountain Running Championships ran for the University of Sherbrooke, while Neff ran in the NCAA with the University of Houston. Both athletes have shown impressive range in their recent running careers. Gosselin is a force in the Quebec running scene, winning the 2012 Sherbrooke half marathon, the 2013 Quebec Mega Trail 25km, as well as taking 2nd at the 2013 Canadian Mountain Running Championships. He is also competed at the Ironman World Championships in Hawaii, and taking 3rd at the North Face Endurance Challenge 50 miler in New York State. Similarly, Neff has turned some of his attention to ultra racing, setting course records at several races in the 50km distance, and recently took 4th place at the Canadian Death Race, a 125km ultra race in the mountains of Alberta that has no shortage of climbing and descending. On the women's side, four competitors will be travelling to Poland, lead by the sole returning member Shannon Penway (North Vancouver, BC). After getting her first shot at the World Championships last year on the uphill only course of Italy, she will be looking to improve or her 65th place from last year on the up and down course of Krynica-Zdr�j. At the Canadian championships, Penway took the bronze medal, and will be joined at World Championships by new Canadian champion Meggan Franks and silver medallist Sarah Bergeron-Larouche. Franks, who currently resides in Mississippi has had some very successful seasons of late, winning the Niagra Falls Marathon in 2011 and the New Orleans Marathon in 2012, and achieving a 6th place result at the Canadian Half-Marathon Championships. She hit her personal bests in the 5k, half-marathon and marathon in 2012. Bergeron-Larouche of Quebec City has an accomplished athletic and sporting career, running for the University of Alberta pandas, and competing nationally in Nordic skiing with Club Nordique Mont Ste Anne. More recently, she won the Defi Des Escaliers 13km in Quebec City, one of the races in the 2012 Coupe Dix30 race series, and took 2nd at the Quebec Mega Trail 10km. Rounding out the women's team is Nationals 5th place runner, Melanie Nadeau. Nadeau's debut appearance for the Canadian team happened at the NACAC Mountain Running Championships in New Hampshire, finishing toe to toe with teammate Bergeron-Larouche in 17th place. The NACAC race proved to be good experience for the first time Worlds runner, as there course of New Hampshire is very similar to what the athletes can expect in Poland. For the second straight year, Canada will also be sending a junior to the world championships, in the form of 18 -year-old new Canadian Junior Champion Mathieu Ladouceur of Magog, QC. Despite primarily focusing his training for the track, Ladouceur took nationals in convincing fashion, with a 1:14 margin of victory. He recently won the junior category at the Demi-Marathon Bonneville De Lachine 5k and the 5k at the D�fi Memphr�. The 29th World Mountain Running Championships are being held September 8, 2013 in Krynica-Zdroj, Poland. More information about the race is available at http://wmrc2013.pl/.